Immigrant rights advocates are denouncing an “appalling and disqualifying” proposal by the acting director of U.S. Immigration and Customs Enforcement (ICE) to charge with federal crimes elected officials who lead sanctuary cities, which often refuse to turn over or identify undocumented residents to the government’s immigration agents. 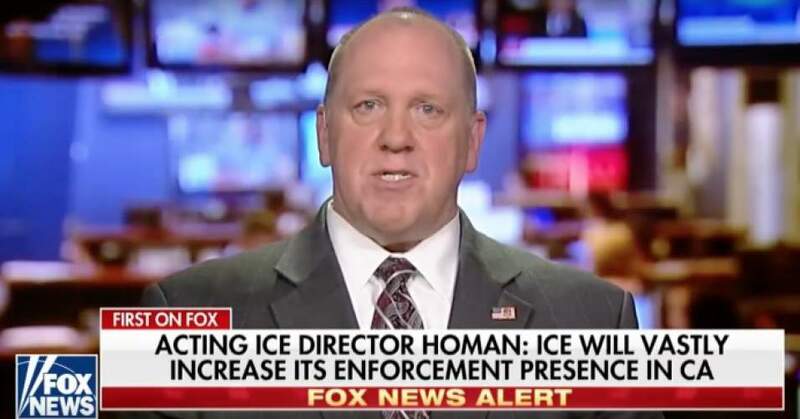 Thomas Homan, acting director of @ICEgov, wants to put state and local elected representatives in jail for not carrying out Trump’s deportation agenda. After California made history earlier this week when it became the nation’s first-ever sanctuary state, Homan responded in an interview with Fox News on Tuesday by warning that “California better hold on tight” and vowing to “vastly increase our enforcement footprint” by upping the number of ICE officers in the state. California’s newly enacted state-wide law “bars law enforcement officers in the state from arresting individuals based on civil immigration warrants, asking about a person’s immigration status, or participating in any joint task force with federal officials for the purpose of enforcing immigration laws,” according to SF Gate. President Donald Trump appointed Homan to serve as acting director shortly after entering office last January. Though Trump announced in November that the acting director was his official pick to permanently lead ICE, Homan is still awaiting final approval by the Senate. This entry was posted in Civil Rights, Corruption, Government, Human Rights, Immigration, National Security vs Police State, Racism, Refugee Issues, Social Justice, Women's Issues, Workers' Issues and tagged Atrocities, California, Civil Rights, Corruption, Department of Justice, Donald Trump, Equality, Human rights, ICE, immigration, Police State, Racism, refugees, sanctuary cities, sanctuary states, social justice, Thomas Holman, Women's Issues, Worker's Rights, workers' issues on January 4, 2018 by ew.